Perché qualcuno dovrebbe stare in un albergo quando si può trascorrere le vostre vacanze nella nostra incantevole un anno e mezzo camera da letto, completamente arredato, condominio recentemente ristrutturato? Questo condominio è stato appena ristrutturato con nuovi graniti, piastrelle, lavandini, tappeti ed elettrodomestici e ha un nuovo letto king pillow top e cuccette con un materasso gemello sul cuscino superiore materasso full size in alto e nuovo sul fondo. C'è anche un futon per una persona in più. Esso è fornito di tutti i comfort necessari per farvi sentire a casa tra cui una nuova lavatrice / asciugatrice, macchina per il caffè, e tutto il necessario per trascorrere un fine settimana o un mese. Questo complesso si trova in famiglia amichevole Sport Village Resort. Ci troviamo nella splendida St. George, Utah, famosa per i suoi paesaggi incredibili, escursionistici e piste ciclabili, campi da golf e parchi nazionali! Godere dei benefici dei servizi del resort che includono: 3 campi da tennis, 2 campi da squash, due piscine, parco giochi per bambini, campo da beach volley, campi da shuffleboard, coperta mini golf, giochi di club house, come calcio balilla e biliardo e un centro fitness. Dispone inoltre di barca sicura, rimorchio o RV stoccaggio. Email me per ulteriori informazioni o se avete domande posso rispondere. Venite con noi nella splendida St. George, Utah. Questo è dove il sole estivo trascorre l'inverno. Condominio ha un full size vasca soaker. Questo è grande per i bambini e coloro che odiano fare un sacco di scale. A soli quattro passi verso condominio ed è molto vicino alla piscina e club house. We stayed for 4 nights at this property. It was really nice. We comfortably had 6 of us sleep there (including a toddler in a portable crib). There is a second bedroom area that is curtained off from the living room with the bunk bed. There was so much fun stuff to do at the club house and it was all free with the pool key! We would definitely rent this again! So glad to hear you enjoyed your stay. Thanks for the review. Very comfortable. Owner was very easy to work with. Clean, Very well maintained, and comfortable. Everything was very clean and well maintained. Great place to stay for a good price. Loved this condo. Great location on the bottom floor close to the parking lot and close to the club house. Condo was clean and stocked with basic needs. Kitchen seemed pretty well stocked with everything we needed while we were there. Bathroom could have used a blow dryer and I’m glad I had read there weren’t beach towels available before we got there so I could bring some along but neither of these would deter me from staying again. My girls loved the twin over full bunk bed with the privacy curtain. Clubhouse was fun with a lot of activities that we used each morning before going swimming in the afternoon. We plan on coming back again and I would fully recommend this stay. I stayed at this property for a girls weekend and we had an amazing time. The place was extremely clean, cute and comfortable! I would highly recommend it! Great family stay and on sight amenities! 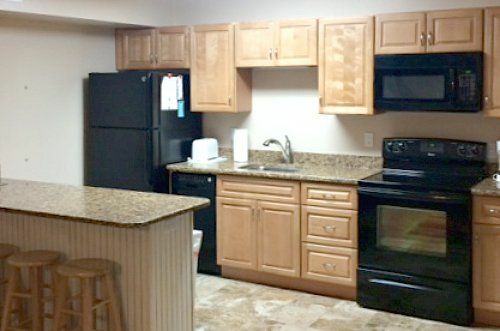 Clean, well taken care of (the clubhouse and apartment) and perfect for a family of 6 or fewer. Just to clarify the security deposit. I collect 100.00 up front. When the condo is left in good condition, the $100.00 deposit is refunded.